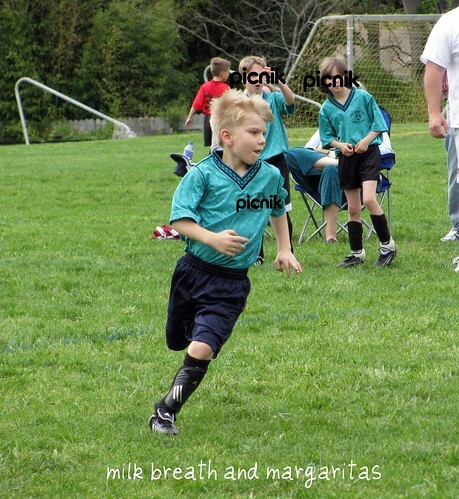 Milk Breath and Margaritas: Wordless Wednesday: Wait! What Happened? Wordless Wednesday: Wait! What Happened? My darling Shark Baby in 2005 - age three. My Shark Boy in 2009 at almost seven. WOW! It goes so quickly and thank goodness for cameras so we can remember. Happy WW. Amy, the first thing I thought when I saw the first piture was; "Ahh... Bear dressed up for Shark's soccer game." Then I read the caption! Shark is quite handsome. You need to get a big stick. While you are at it you might as well get one for Bear. You are really going to have to beat off the girls. He is such a gorgeous little man. Wow. And ya know Amy, I have been asking myself this very same question ever since posting the pics of Imp on the horse, this past weekend. It really does go by so rapidly, doesn't it? Kinda makes me melancholy. Pretty soon it will be no good-bye kisses and wanting to be let out of the car two blocks from school. If he's not there yet, treasure these times. Ahhh, from a gorgeous 3 year old into a handsome 7 year old. Doesn't time fly when you're enjoying yourself! Y'all are so right - it just goes so very fast. Awww, they grow up way too fast! Great photos! Ack! Tell him to stop growing up so fast! He is such a handsome boy!!! I know what you mean about wondering what happened all too well. He looks like a pro. And a man on a mission! Darling photos. Oh my gosh. 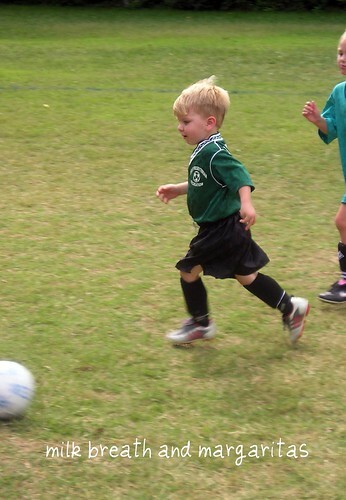 My 4 yr old started soccer this Spring. I guess this is what I have to look forward to in a few years. Sigh. They grow up way too quickly! oh, i know how you feel. just yesterday my boy wonder was playing swarmball. now he's assistant coaching high school soccer!! what in the world! oh, and i tagged you on my blog. hope you have a minute to check it out. He looks exactly like Bear in the first picture! So sweet. My son promised to stay 3, then he promised to stay 4... he's 10 now, but has made up for breaking his former promises by suggesting that when he grows up and gets marries, he will buy the house next door and visist me every day from 10-4. His wife will LOVE that I'm sure! They grow way too fast! Great photos!